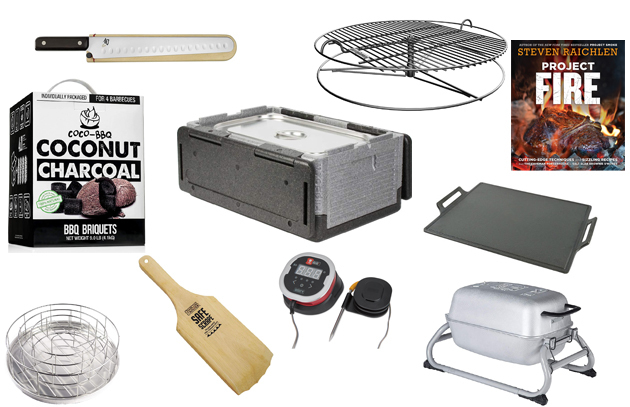 Once again, we’re proud to present our annual holiday gift guide to make shopping for the barbecue enthusiast on your list stress-free. Everything from stocking stuffers to a slot at Barbecue University is included, just a few of our favorite things, and in all price ranges. Maybe you can use our suggestions to build your own wish list. In any case, happy browsing! PKGO Portable Grill: Here’s a portable variant of the original PK grill that debuted in 1952 to enthusiastic reviews. Made of lightweight oxidation-resistant cast aluminum, an efficient conductor of heat, this diminutive grill is as functional as its larger counterpart (although it is best for foods that require direct grilling). Fold-up legs make this a superb grill for tailgating, camping, picnics, or the times when smaller loads of charcoal are needed—a weeknight supper for 2 or 3, for example. 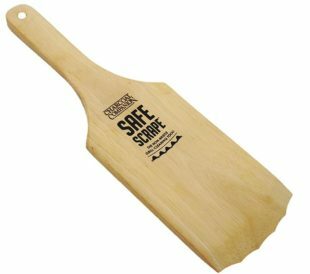 Use only on non-flammable surfaces. Comes with a 10-year warranty. Interested in other PK Grills, click here. 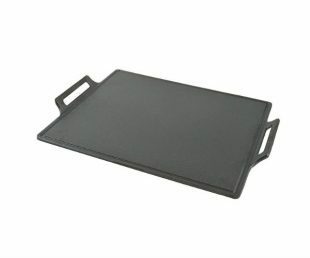 Best of Barbecue Plancha (Cast-Iron Griddle): The Spanish call it la plancha. Argentineans call it la champa. We call it the best way there is to cook Spanish-style seafood and veggies over a wood, charcoal, or even gas fire. The Steven Raichlen Best of Barbecue cast iron plancha gives foods a crusty, smoky sear while keeping them succulent on the inside. The plancha is excellent for delicate fish, shrimp, vegetables—anything that tends to break apart, fall through the rungs on the grill grate, or dry out on the grill. Raised side handles for easy moving on and off the grill. Shun Classic Brisket Knife: This knife, forged in Seki City, Japan, by craftsman acquainted with samurai sword traditions, is invaluable if the pit master in your family routinely smokes large hunks of meat—brisket, beef shoulder clod, or even ham. Featuring a hollow-ground blade forged of VG-MAX steel, it doesn’t tear or shred the meat like some knife blades do. The handle, crafted of durable Pakkawood, is D-shaped for maximum comfort and control. Pair it with Steven’s latest book, The Brisket Chronicles, now available for preorder (release on April 30, 2019). GrillUp Height-Adjustable Charcoal Grate: Reminiscent of the adjustable grill grates common to grills built in the 1950s, the GrillUp BBQ grill grate is an ingenious alternative to fixed grill grates. A central screw mounted to a stable stainless steel base allows you to move the grill grate closer to or further away from the coals giving you more control over cooking temperatures and flare-ups. (We’d love to make Memphis-style dry rubbed ribs on this grill grate.) Fits all 22- and 22.5-inch kettle grills. 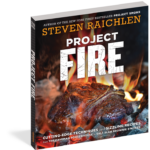 Project Fire by Steven Raichlen: Released in May, 2018, this is the information-packed companion book to Project Smoke (May, 2016). Both books make a superb gift for grilling and smoking enthusiasts in your life, especially the ones who are intent on expanding their barbecuing horizons. Both feature the latest techniques along with inspiring full-color photos and over 100 irresistible new recipes. 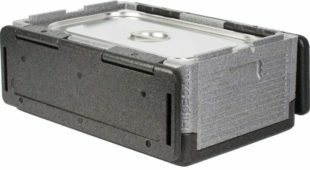 Collapsible Iceless Flip Box Cooler: Yes, you read that right—a cooler that doesn’t require ice, but keeps food cold (or even frozen) for hours. Works for hot foods, too. 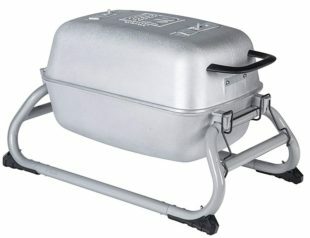 Though it weighs only 2 pounds, this durable cooler boasts a 41-quart capacity—it’s large enough to rest several barbecued briskets or keep up to 60 cans of beer or soda pop ice-cold. How is it possible that no ice is required? The secret is the temperature-lock technology with interwoven polypropylene “cells” that trap hot or cold air. Great for tailgating, barbecues, or picnics. Keep one in the trunk of your car for safely transporting temperature-sensitive meat, seafood, produce, and prepared foods. Barbecue University, 2019: The ultimate gift for anyone wants to take his/her grilling and smoking skills to the next level. This year’s theme is “Smoke and Fire.” Taught by Steven Raichlen, this intense hands-on 3-day class is hosted by the luxurious Forbes 5-Star Broadmoor Resort in Colorado Springs, Colorado. More than three dozen dishes will be prepared on BBQ U’s jaw-dropping collection of grills. Food, fun, and fire make for an unforgettable experience, one some people repeat year after year. Two sessions are scheduled: May 23 to 26 and May 26 to 29. For more information,click here. Don’t delay. Enrollment is limited to 55 students per session, and classes fill up fast. 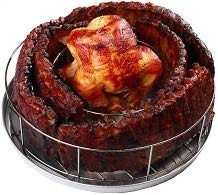 Rib Rings by BBQ Guru: Barbecue accessory maker BBQ Guru recently introduced a clever device that enables you to smoke up to six racks of ribs (baby backs or St. Louis-cut spare ribs) on any grill with a grate that’s at least 18 inches in diameter. Concentric stainless steel rings corral the ribs by holding them vertically, one of our favorite ways to cook ribs. (The ribs become self-basting). This is especially good news for owners of kamado-style grills as it can be fiendishly difficult to fit more than one rack of ribs on their small circular grates. The rings and the accompanying drip tray are dishwasher safe. 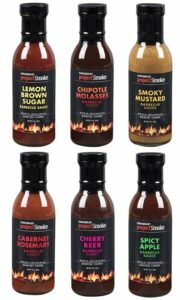 Steven Raichlen Project Smoke Spice Rubs and Sauces: This holiday season, give electrifying sauces and rubs developed by America’s foremost authority on grilling and smoking, Barbecue Hall of Famer Steven Raichlen. The rubs include Santa Fe Coffee Rub, Kansas City Smoke Rub, Malabar Steak Rub, Carolina Pit Powder, and Greek Island Herb Rub. In the sauce line-up are Lemon Brown Sugar, Chipotle Molasses, Smoky Mustard, Cabernet Rosemary, Cherry Beer, and Spicy Apple. Crowd Cow Craft Meats: Even the most ardent supporters of farm-to-table eating admit that sourcing high-quality meats from passionate farmers and/or ranchers can be challenging. Finding the meat at its source, arranging for payment and pick-up, and storing large quantities of it—well, you get the picture. So did Ethan and Joe, who came up with the brilliant idea of “crowd funding” a cow so many people could buy small quantities of premium beef. Whether it’s richly marbled grass-fed Wagyu from purebred cattle raised in the San Juan islands or Angus from one of America’s most quality-conscious farms, Crowd Cow ships all over the country. They’ve expanded their line to include Heritage breed pork and chicken, too. Perfect for gift giving or your holiday table. COCO Eco-Friendly Barbecue Charcoal: If you have any pit masters on your list who are also environmentalists, they’ll appreciate the benefits of this all-natural charcoal. 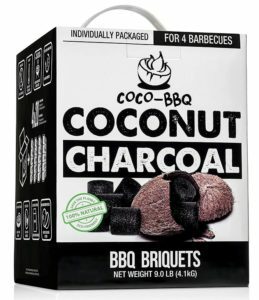 Made from compressed organic and GMO-free coconut shells, this charcoal burns up to three times longer than conventional petroleum-based briquettes or lump charcoal, meaning less is required during cooks. We have used coconut charcoal on several episodes of Project Fire and Project Smoke with great results. This is one kind of coal we wouldn’t mind getting in our stockings! 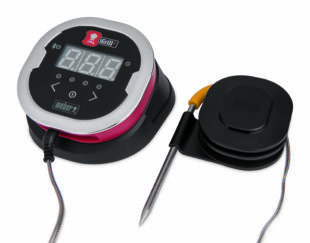 Weber iGrill 3 Thermometer: Never underestimate the importance—and usefulness!—of an accurate remote thermometer. Weber’s latest iGrill accessory features Bluetooth connectivity enabling you to sync it with most newer iPhones, Androids, or iPads. 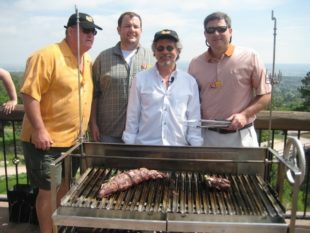 Four heat resistant meat probes enable the pit master to monitor four separate meats (two meat probes are included). The unit permanently mounts to the side table and fits the Weber Genesis II, Genesis II LX, and Spirit II gas grills.